Nicola Tidey (Immediate Past President, APCO International Executive Council Delegate) is the Director of the Orange County Emergency Communications Center. She has been in public safety for 18 years, starting as a volunteer firefighter/EMT and then in 2002 joining the communications field. During her career, Nicki has worked her way through the ranks serving as CTO, Supervisor, Training Coordinator, and now as 9-1-1 Director. It's through these diverse roles that Nicki has been able to be actively involved in not only Virginia APCO but APCO International. At the International Chapter level, Nicki has served on the Communications Center Standards Committee, currently chairs the Occupational Analysis Sub-Committee, and has in addition contributed to other various workgroups and committees. In 2011, Nicki was the recipient of the Governor's Award for Outstanding EMS Telecommunications Officer/Dispatcher. 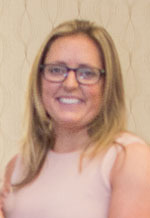 She served as Chapter President in 2016. Her home is in Bealeton where you will find her CrossFitting or hanging out on her 11 acres with her family and 2 dogs.